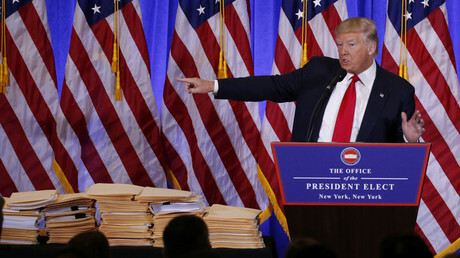 US President-elect Donald Trump answered a barrage of questions ranging from his relations with Putin to the latest report that Moscow may be blackmailing him – which he called 'fake news' and criticized Buzzfeed and CNN for running it. “This political witch-hunt by some in the media is based on flimsy reporting, and is shameful and disgraceful,” he said. “A group of my opponents got together, sick people, and they got that crap together,” Trump said. “Does anyone really believe that story?” Trump asked the press, adding that he always told his employees to be very careful when they travel, lest they end up watching themselves on television. The topic culminated with Trump calling BuzzFeed "a failing pile of garbage" and refusing to answer a question from CNN reporter Jim Acosta. 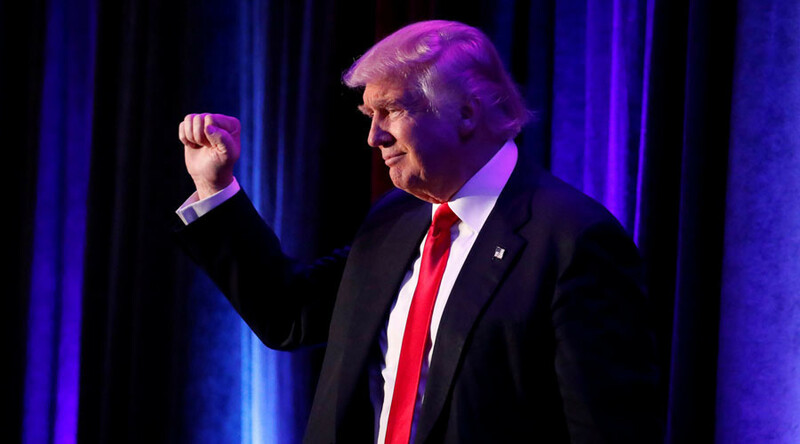 The president-elect then moved on to a wide range of issues, from building factories to his inauguration. “Big news is going to be announced over the next couple of weeks,” about companies going to build factories in the Midwest, Trump said, citing recent announcements by Ford and Fiat Chrysler as examples. Big pharma is “getting away with murder,” said the president-elect, adding that he intends to save billions by overhauling the bidding system for medication. The generals and admirals have “been fantastic” about reducing the costs on the F-35, Trump said, referring to the stealth fighter made by Lockheed Martin and plagued by cost overruns and technical issues. “I’m really proud of what we have done and we haven’t even gotten [to the White House] yet,” saidTrump. The majority of questions from reporters focused on Russia and the intelligence reports on Moscow's alleged interference in the US election. “Hacking’s bad, and it shouldn’t be done. But look at what was learned from the hacking: That Hillary Clinton got questions to the debate, and didn’t report it? That’s a horrible thing,” Trump said. Answering questions about his relations with Russian President Vladimir Putin, Trump said that “if Putin likes Donald Trump, I consider that an asset, not a liability." "Do you honestly believe Hillary would be tougher on Putin than me? Give me a break," he said. He said he was offered $4 billion for deals in Dubai over the weekend, but turned it down. “I have a no conflict-of-interest provision as president,” Trump said. “So I could actually run my business and run the country at the same time.” He said he could do it, but did not want to. “My two sons, Don and Eric, are going to be running the company,” Trump said, turning over “complete and total control” of the Trump Organization to his children. Trump “has relinquished leadership and management” in the Trump Organization, and all his investments will be conveyed to a trust before January 20, said Sheri Dillon, partner at the law firm Morgan Lewis, who led the legal effort to structure the handover to Trump’s sons. Trump’s daughter Ivanka will have no involvement or management authority in the Trump Organization. “No new foreign deals will be made whatsoever” during the Trump presidency, Dillon added. Domestic deals will be allowed, but without Trump’s involvement or knowledge, and would be examined by an ethics advisor. “President-elect Trump should not be expected to destroy the company he built,” Dillon said, explaining why the Trump brand and the organization were not liquidated, sold to his children, or opened to public ownership. To ensure no conflict, real or perceived, with the Emoluments Clause of the Constitution, Trump has decided he will “voluntarily donate all profits from foreign government payments made to his hotel to the US Treasury,” Dillon announced. Trump also threw his support behind former Exxon CEO Rex Tillerson, who was testifying at that moment before the Senate on his nomination to head the State Department. “I think it’s brilliant, what he’s doing and what he’s saying,” Trump said. Several of Trump's Cabinet picks are undergoing confirmation hearings in the Senate. Former Exxon CEO Rex Tillerson, nominated to head the State Department, is running the gauntlet on Wednesday morning, similar to what Alabama Senator Jeff Sessions went through on Tuesday. In comparison, the lawmakers went easy on retired Marine General John Kelly, nominated to head Homeland Security. “Obamacare is the Democrats’ problem… We’re doing the Democrats a great service” by taking it on, Trump said. Trump also warned companies that they can move freely within the United States, but if they want to take their business abroad, penalties are to come. His pick to replace "the late, great Justice [Antonin] Scalia" on the US Supreme Courtshould be announced within two weeks of the inauguration, the president-elect said. Of course, a Trump press conference would not be complete without questions about the border wall with Mexico.